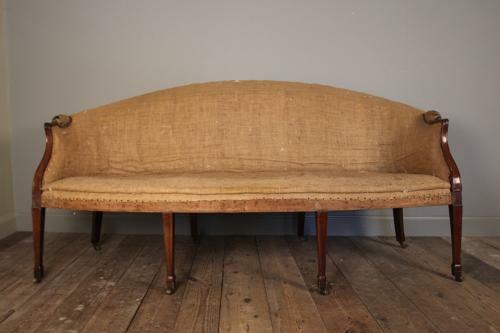 An 18th Century Mahogany Hepplewhite Period Sofa for re-upholstery. This beautifully proportioned sofa having 4 tapering front legs with superb original brass cup castors and 4 splayed back legs with period replacement brass castors The sofa retaining the horse hair inners. Englsih, Circa 1870.